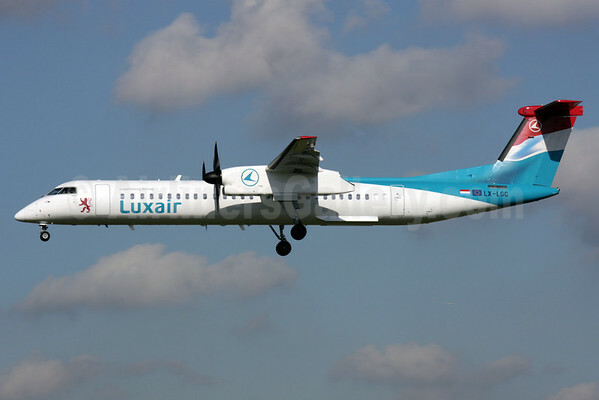 Luxair Société Luxembourgeoise de Navigation Aérienne S.A. (Luxair), the national airline of the Grand Duchy of Luxembourg, signed a firm purchase agreement for three Bombardier Q400 NextGen aircraft and options on an additional two Q400 NextGen aircraft. Copyright Photo: Antony J. Best/AirlinersGallery.com. Bombardier DHC-8-402 (marketed as the Q400) LX-LGC (msn 4162) approaches the runway at London Heathrow. This entry was posted in Luxair and tagged 4162, Bombardier, Bombardier DHC-8, Bombardier DHC-8-400, Bombardier Q400, DHC-8, DHC-8-400, DHC-8-402, Grand Duchy of Luxembourg, Heathrow, LHR, London, Luxair, LX-LGC, national airline, Q400 on February 15, 2015 by Bruce Drum. 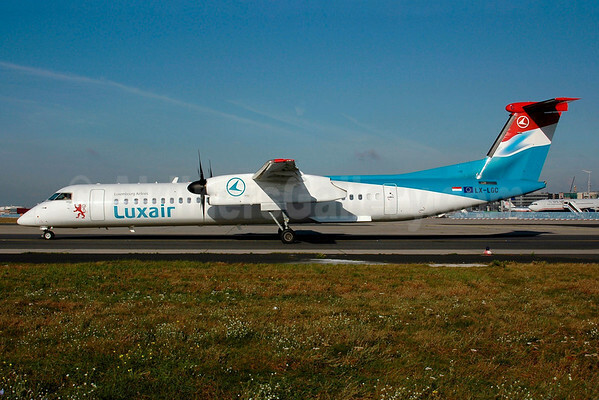 Luxair (Luxembourg) will operate summer seasonal service from Luxembourg to Olbia (twice weekly with Bombardier Q400s) from May 17 through September 27, 2015 per Airline Route. In addition, the carrier will also operate to Palermo starting on May 24, 2015 with Embraer ERJ 145 regional jets. From July 5 through September 13, 2015 the airline will operate a Luxembourg-Malta-Palermo-Luxembourg routing. Copyright Photo: Bernhard Ross/AirlinersGallery.com. Bombardier DHC-8-402 (Q400) LX-LGC (msn 4162) taxies onto the runway at Frankfurt. This entry was posted in Luxair and tagged 4162, Bombardier, Bombardier DHC-8, Bombardier DHC-8-400, Bombardier Q400, DHC-8, DHC-8-400, DHC-8-402, FRA, Frankfurt, Luxair, Luxembourg, LX-LGC, Olbia, Palermo, Q400 on December 7, 2014 by Bruce Drum. Yakutia Airlines (Yakutsk) has become the first operator of the Bombardier DHC-8-402 (Q400) in Russia. The far north carrier put the new type into revenue service in late January. Yakutia Airlines, a domestic passenger carrier based in the northeast region of Russia, will fly three Q400 aircraft, with the first (DHC-8-402 VP-BKD, msn 4162) having arrived in late January at Yakutsk Airport. Yakutia’s fleet comprises a total of over 30 aircraft and it operates with hubs in the cities of Yakutsk, Moscow (Vnukovo) and Krasnodar. Its network includes routes in the Republic of Sakha (Yakutia), other regions in Russia and international flights. 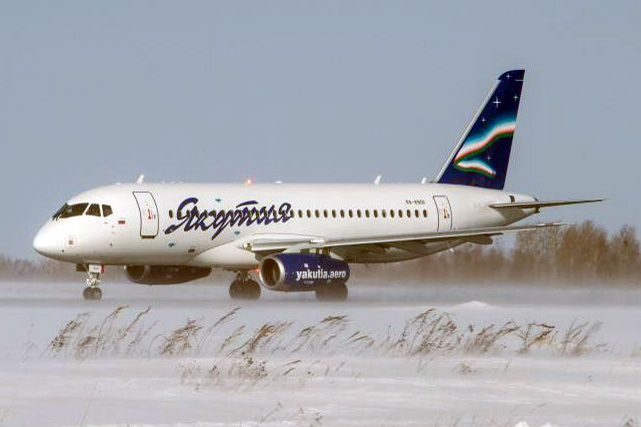 In the territory of the Far East federal district, Yakutia operates flights in eight of nine sub-districts, allowing passengers to make point-to-point connections within the region. Bottom Copyright Photo: Yakutia Airlines. Yakutia operates in a very demanding region of Siberia. On January 31 the airline took delivery of its second Sukhoi Superjet 100-95B (RA-89012, msn 95020). This entry was posted in Yakutia Airlines and tagged 4162, 95020, aviation, Bombardier, Bombardier DHC-8, Bombardier DHC-8-400, Bombardier Q400, DHC-8, DHC-8-400, DHC-8-402, Q400, q400 aircraft, RA-89012, SSJ100, Sukhoi, Sukhoi SuperJet, Sukhoi Superjet 100, SuperJet, Superjet 100, Superjet 100-95B, transportation, VP-BKD, yakutia, Yakutia Airlines on February 16, 2013 by Bruce Drum.